My friend Debra Hamel gave me a beautiful book about a snail (The Sound of a Wild Snail Eating by Elizabeth Tova Bailey) a few years ago, and now this is joined by another one, courtesy of Alma books. The important point about the snail, in both cases, is that it is slow. 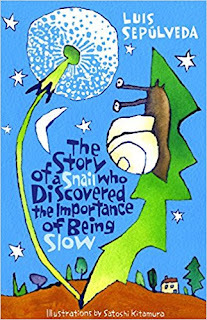 Following its track across the floor allows plenty of time to reflect - for the invalid recuperating on a bed and also, according to the The Story of a Snail who Discovered the Importance of Being Slow the snail itself. The snail in this children's story by Luis Sepulveda is the type of animal that asks questions. One thing bothers him in particular: why are snails so slow? The answer, the owl tells him, is that he is carrying a weight on his back. But that doesn't seem quite right to the snail, and he continues to bother the snail community until he is exiled. From here it is a classic story of a quest. His allies are other creatures including another slow creature, a tortoise. The tortoise, of course, is another slow creature, and he is old and wise (I can personally vouch for this: my own tortoise is very old and she never moves unless she absolutely has to). These two amble along together for a while until they reach 'The End of Life' (a dark level surface ''as though a slice of dark sky had become stuck to the ground'). This is the forewarning of something even more sinister that has the potential to wreak disaster to the snails. So now the snail's quest becomes a mission to not only warn but convince his relatives. This is not straightforward and not without casualties, but the ending is satisfying and optimistic. I should see if I can read The Story of a Snail. Hopefully I can find it here in the US, too. I hope so, Deb! It's a good story, especially for children. 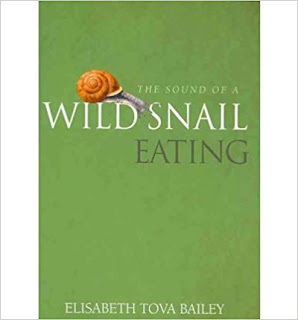 I love it when I am surprised by something I know nothing about like snails. Yes, Anne! Snails are surprisingly interesting, I find.